Experience the best tasting and highest quality of natural sweeteners in Australia from Nirvana Organics® – organic stevia. For years, followers of weight management programs and those needing to monitor their blood sugar levels have resorted to artificial sweeteners to sweeten their food and beverages, but in recent times there have been many reports suggesting that naturally derived, low-calorie sweeteners would be a much better substitute. 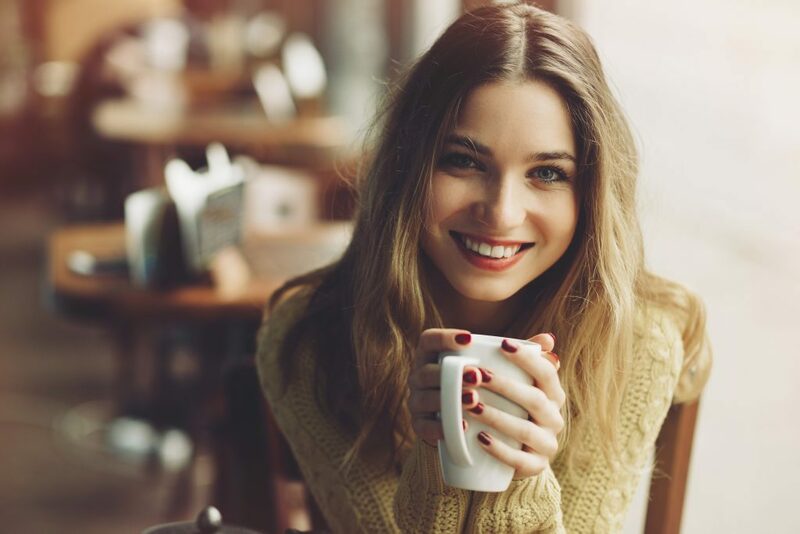 Artificial sweeteners have now been linked to many dangerous and unwanted side effects, and so Nirvana Stevia was born to provide a safe and healthy alternative to customers who are wanting to ditch the sugar and take control of their health! Nirvana Organics® has travelled the world to find the perfect alternative, and we found one in the naturally sweet, zero calorie herbal extract, Stevia. The key to a great tasting Stevia product is the quality of plant, growing conditions, extraction process, and care in manufacturing and our customers believe Nirvana Stevia is simply the best! ZERO Calories, ZERO Carbs, ZERO GI. 100% natural with NO NASTY additives. Highest quality, best tasting Stevia on the market! Nirvana Organics® Stevia- 15 years in the market & going strong! Easy, innovative and convenient packing options. Concentrated, economical and best value for money – a little goes a long way. 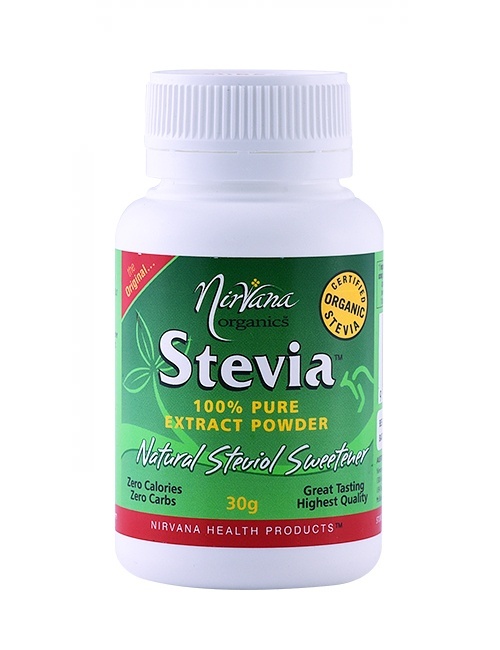 15gm of Nirvana Stevia Extract provides 250 servings! Did you know many supermarket natural sweeteners that are marketed as ‘stevia’ may contain less than 5% stevia? Have you read the ingredients list? Nirvana Organics 100% Pure Extract Powder is just that – 100% PURE STEVIA. Used for centuries in Paraguay and Brazil, Stevia leaves were not only a natural way to sweeten food, but also a digestive aid, a tonic and a topic aid in wound healing. It was eventually “discovered” in the 1880s in the forests of Paraguay by Italian botanist Dr Moises Santiago Bertoni and it wasn’t long before the secret of this “sweet herb” reached the rest of the world. In health-conscious Japan, artificial sweeteners, such as aspartame, have been banned for over 30 years and natural Stevia is being used in over 30% of the country’s food products. Stevia has been used in Japan in several major packaged-goods brands, including soft drinks and sugar-free gums from overseas, and is a staple for families and households around the country. Brazil, China and South Korea closely follow Japan in Stevia consumption, with over 400 tonnes of Stevia consumed per country each year. Introduced to South Korea in 1973, Stevia currently accounts for 40% of the sweetener market and it is being used more widely in the food industry as a sugar substitute than any other alternative sweetener, for products ranging from ice cream to sweetened beverages. Following on from the popularity in South America, South Korea and Japan, Stevia is growing in popularity in North America, Malaysia, Israel, the Pacific Rim and now in Australia, with Nirvana Organics® pioneering the way in natural, safe and 100% organic Stevia. The growing demand for this sweet herb led us to source the highest quality Stevia available, and because of this we have been setting the pace in local Stevia sales for years. Unlike some other products on the market that use inferior Stevia extracts with a grassy, bitter after-taste that can be overloaded with synthetic fillers and/or additives, Nirvana Organics® Stevia is 100% natural, organic and comes from the best part of the Stevia Rebaudiana Bertoni plant. Our product has a superior taste because we source the highest quality Stevia extract powder and our sweeteners are naturally sweet and delicious. Nirvana Organics® Stevia is of an exceptional quality and is highly concentrated, meaning it is very economical. You only need a small portion to deliver a sugar-free boost of sweetness to your favourite hot or cold beverages. Now you can enjoy the delicious taste of an exceptional, healthy and quality sweetener, without the worries! Good health is the greatest gift you could ever give your family and Nirvana Organics® Stevia is ideal for families, as it is has no calories, is 100% natural, has not been branded for harmful side effects, does not damage teeth and gums or cause cavities. Your children will love the sweet flavour, and you will have the peace of mind that your family are using products that are made from the highest quality, certified organic Stevia available. 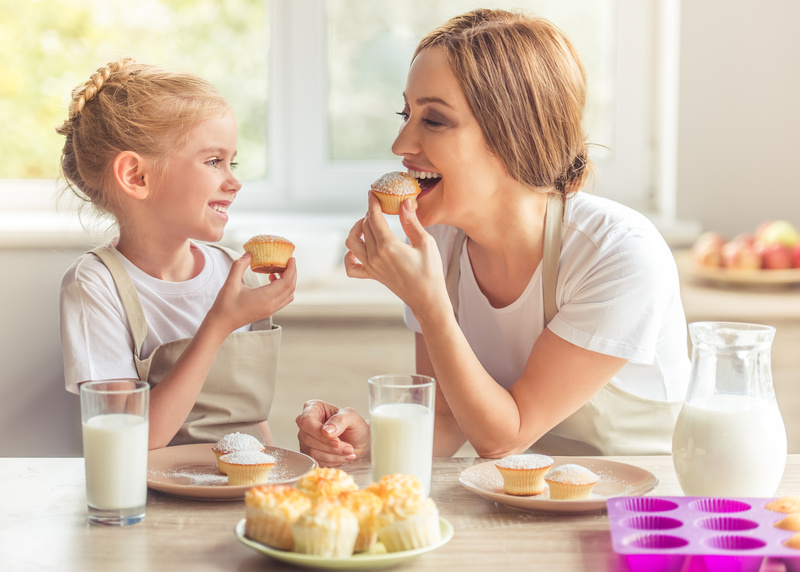 With an abundance of delicious Stevia recipes available, your family can still enjoy the treats they love. Stevia is renowned to contain many nutrients including calcium, phosphorous, as well as sodium, magnesium, zinc, rutin, vitamin A, vitamin C and over 100 phytonutrients, making it ideal for health conscious individuals. Organic sweeteners for weight management – no calories, no carbs, no chemicals! We are all aware of the dramatic increase in the incidence of excess weight in both adults and children, with many scientific reports attributing this to the abundance of sugar in our diets. Refined sugar is virtually devoid of nutritional benefits and represents empty calories and, in response to this, Nirvana Organics® Stevia has become an increasingly popular, natural alternative. 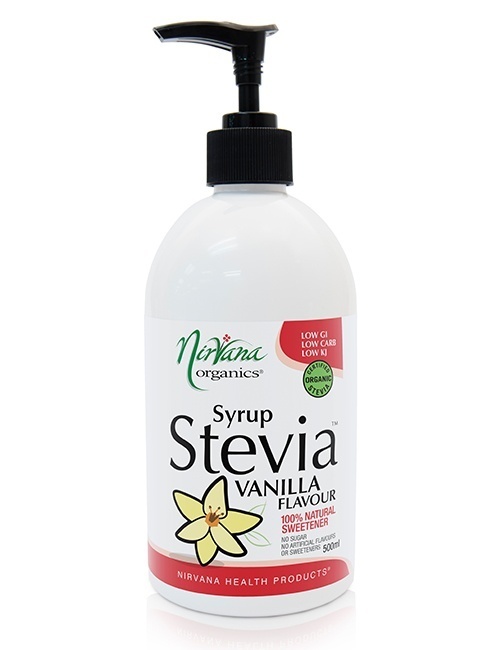 Popular with followers of weight management programs, Nirvana Organics® Stevia has no calories or carbohydrates, but provides a much-missed sweet flavouring that can be used for anything from hot drinks to baking. Stevia has a Zero Glycaemic Index and does not raise blood sugar levels when ingested, so unlike foods with a high GI, users of our Stevia do not feel a sudden burst of energy followed by fatigue and a need for another “fix”. In fact, many natural health practitioners believe that Stevia has a regulatory effect on the pancreas and it could be an option for people with diabetes or hypoglycaemia. Some reports have also shown Stevia increases energy, aids digestion and gastrointestinal functions and has other benefits, and the sweet taste of Nirvana Organics® Stevia will keep cravings at bay and leave you satisfied for longer. Measure Doses – Good Things Come in Small Doses! At Nirvana Organics®, our exceptional quality Stevia is very concentrated, and is much sweeter than sugar. In the past, consumers have used incorrect measures of Stevia, and this has influenced their opinions of this remarkable herbal extract. To ensure you use the correct amount, Nirvana Organics® Stevia is available in measured dose tablets, liquid concentrates and powders, so you don’t have to worry about using too much and can simply achieve your desired level of sweetness. Our high quality product is so economical that one teaspoon of our original powder is the equivalent of 35 teaspoons of sugar, so we have included our handy (and tiny!) easy-measure scoop for your convenience. We have taken the guess work out of measuring your sugar-equivalent Stevia dose, with one scoop approximately equalling one teaspoon of sugar. Now the perfect level from organic sweeteners is at your fingertips! Our Nirvana Organics® Stevia Liquid Concentrate is available in three sizes and is convenient to use. Unlike some other Stevia liquids on the market, our product is free from harmful preservatives and additives. 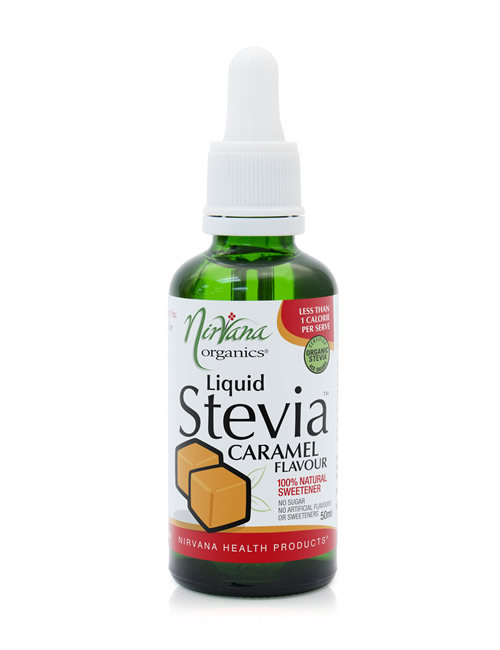 Nirvana Organics® Stevia Liquid Concentrate uses only organically grown Stevia extract, which has been extracted without the use of chemicals, and is then carefully blended with distilled water and the most natural preservatives available. Again, our superior product is so highly concentrated that you only need a few drops. Nirvana Organics® Original Stevia Tablets are available in convenient pocket size containers that fit easily in handbags or pockets – perfect for busy people on the go who never want to be without their natural sweeteners. 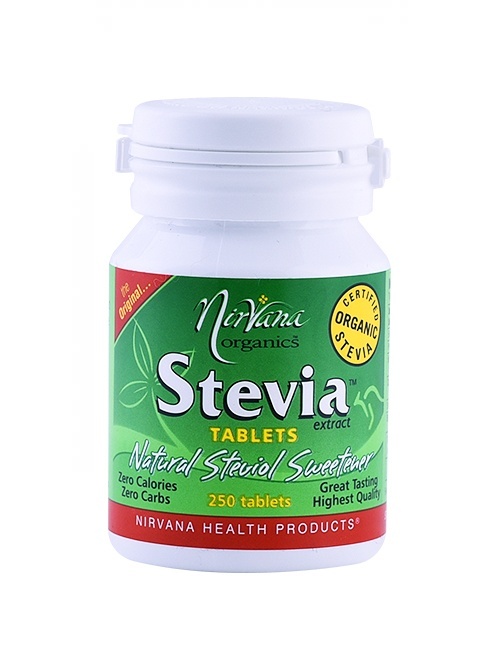 Our Nirvana Organics® Original Stevia Tablets equal one heaped teaspoon (7g) of sugar, which is far sweeter than any other Stevia brand on the market. 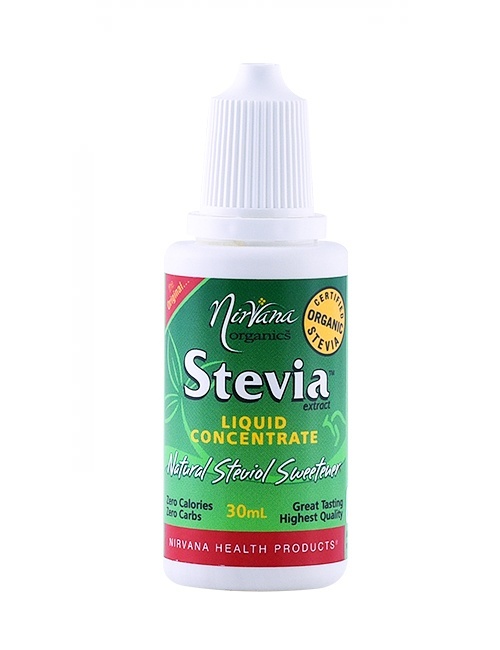 For those wanting a less concentrated Stevia tablet, we have now introduced Stevia Slim 200 tablet dispenser, with each tablet equalling approximately 1 level teaspoon (4g) of sugar. For easy measuring and cooking with Stevia, we have introduced our new Stevia Slim Spoonable Powder®. 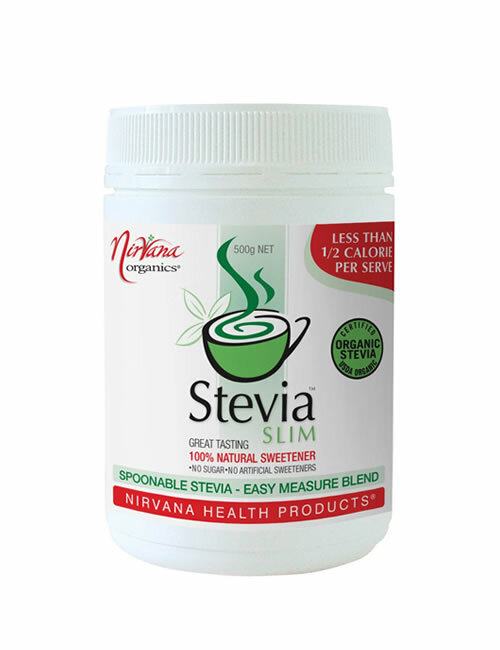 Blended with Erythritol (the most superior naturally derived sugar substitute that looks and tastes very much like sugar), Stevia Slim Spoonable Powder® is the perfect way to add sweetness to your food and drinks and, with only half a calorie per serve, without the guilt. One teaspoon of our Stevia Slim Spoonable Powder® equals the sweetness of two teaspoons of sugar, making it ideal for cooking delicious treats, including pastries, cakes, biscuits, muffins and pancakes or for flavouring desserts like ice-cream and custard. You can even create your own natural and healthy, sugar-free drinks, including delicious smoothies and health shakes – with Stevia Slim Spoonable Powder®, the possibilities are endless.